Hey! That’s Grand Rapids, Michigan! I grew up there! Well, more specifically, I grew up about 60 miles away from there, but it’s the closest major city. If I’d known it had superheroes I would have visited more often. 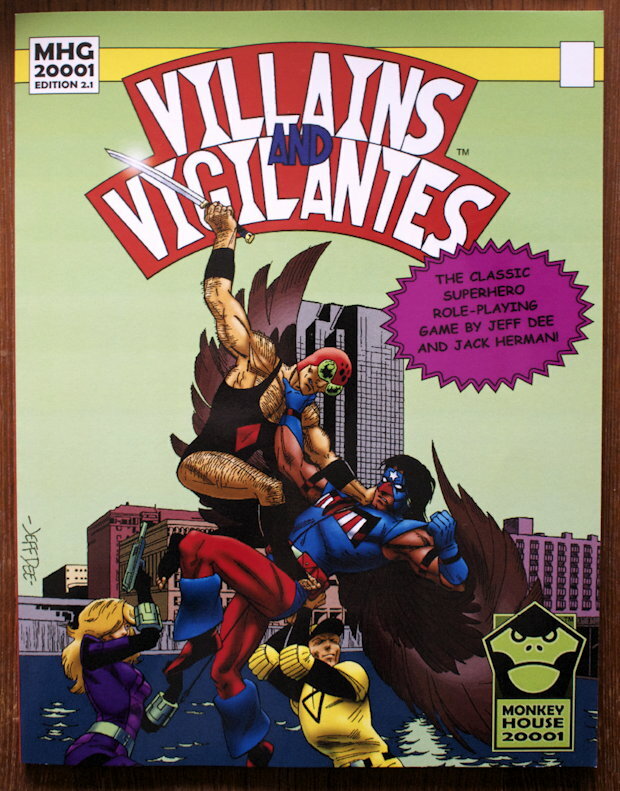 Despite having written my own superhero role-playing game long ago, if I were to run a supers game this weekend, I’d use Villains and Vigilantes. As much as I enjoy my memories of using it, Men & Supermen is inscrutable. When I was an obsessed college student, obsessive detail (though, even then, not at the level of Champions) made sense to me. Now, I can’t understand the rules I wrote. The only disappointment for me back in the old days was that, in V&V, unconsciousness is pretty common. Your average male character is likely to have about 4 hit points; your average female about 3 hit points. They have a Power Point score of about 40, which means that they can reasonably take four points of damage for their first attack, and then three points for the next three subsequent attacks. Any damage taken beyond that goes to hit points; like original D&D, zero hit points means unconsciousness. Your average punch does 1d4 points of damage. An agile or intelligent person will gain bonuses to damage (strength applies to what the initial die rolled is); many powers will, as well, and weapons also add to that total. Which means that it doesn’t take much to knock someone out with one or two punches. Having armor of some kind is fairly essential in this game. In its defense, it is very hard to die unless you’ve got a sadistic villain who keeps pounding you after you’re down. Which is good, because the default in V&V is to play yourself in a world of superheroes. 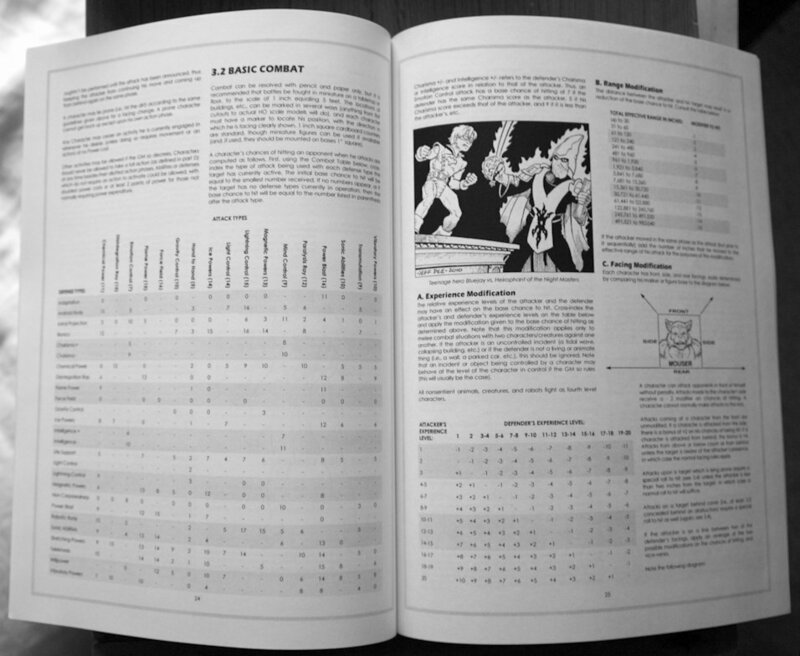 In its basic form, it doesn’t even have you roll up initial stats: your GM rates you, personally, on the five stats (strength, endurance, agility, intelligence, and charisma) and you play yourself in a superhero universe. You then roll up three to eight powers, discard one, and roll a weakness; then, optionally either keep the weakness or discard both the weakness and one other power. Here’s an example. I rolled 3 on d6 for number of powers, so I get to roll 5 powers. I choose to roll all of them on the Powers table. My weakness is Phobia/Psychosis. I could choose to discard another power to discard that weakness, but I want to keep all four powers. The GM will decide what my Phobia/Psychosis is, but I’m guessing that something on the order of fear of open spaces2 would work. There may be some other options depending on how “I” got the powers. This “2.1” edition, product ID 2001, is very similar to the “revised rules” version I have, product ID 2000 from 1982. There are some modifications to the original rules. For example, my non-corporealness costs 7 Power Points per hour. In the original rules, it only cost 4 Power. The GM will choose my ability scores, but assuming that they are all average I’d have a Power of 40 (the combined total of strength, endurance, agility, and intelligence3); that difference in power costs is substantial. That and a typo are the only differences in description between the two rulesets for this list of powers and weaknesses. Darkness control and Phobia/Psychosis are exactly the same in both versions. There are a couple of additions to the game since the last version. The older version only goes up to 8.8. The new version includes 8.9 (shields) and 8.10 (Mexican wrestling moves). It also has a new dedication; there are probably other minor changes that I didn’t notice reading through it. 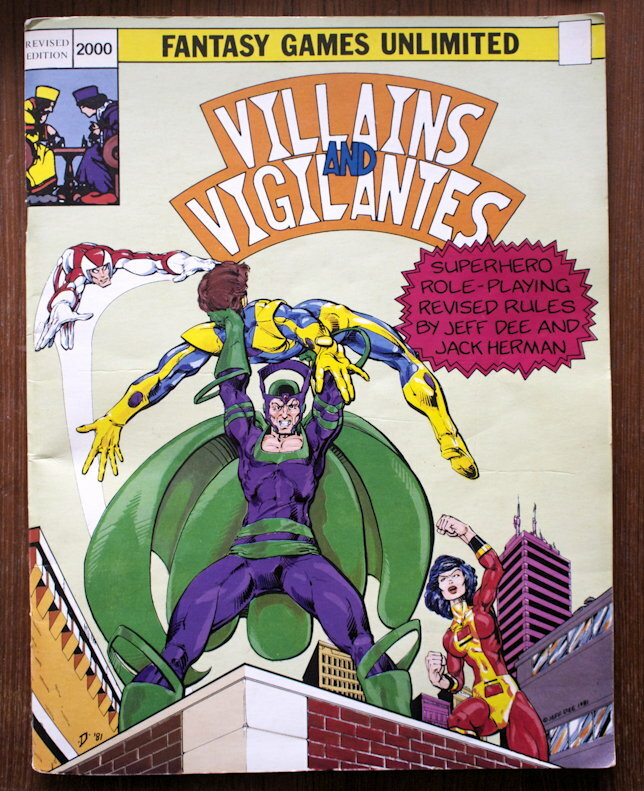 It’s been a long time since I’ve played Villains and Vigilantes! Combat remains the same. You roll a d20 to see if you hit, and you gain bonuses due to skill. One of the neat features of Villains and Vigilantes, however, is that the base chance to hit varies according to the defense type and the attack type. The core of the combat system is a chart that lists all of the defense types (such as Android Body, Force Field, and Stretching Powers), and all of the attack types (such as Disintegration, Flame Power, Hand to Hand, and Sonic Abilities). And then it provides the base chance to hit according to how easy it is for that power to get through that defense. For example, if I want to punch someone who has an android body, I need to roll 3 or less on d20. If I switch to pummeling with my force field, then I need to roll 16 or less. When more than one defense applies, use the lowest number, but there is always a chance of hitting! Even if I try to punch an astral projection, I need to roll 0 or less on d20; if I have an experience bonus, or a detect weakness bonus, I can increase that number; and a roll of 1 always hits in any case. A force field will hit an astral form on a 16 or less, however, so I shouldn’t have to resort to punching the air if I have the Power left to use it. Force fields look to be fairly powerful. The only defenses they don’t easily get through are magnetic powers (requiring an 8 or less), and other force fields, which require a 0 or less. I really ought to consider dropping something other than heightened strength, so that my force fields actually do damage when they hit! Another neat trick is that any character can attack as many opponents as they want at a time4. The default is to attack a single opponent. But let’s say I want to pummel four henchmen with my force field. I’ll need to spend the power cost for each pummel, and I’ll need to roll to hit on each. The catch is that if any roll fails, they all fail. But if they all succeed, then I have pummeled four henchmen on one action. This ability becomes more useful as characters rise in level; if I were 6th level or higher, and the henchmen were 1st level, then I would have to roll 19 or less to hit them—making it easy for high level characters to take out henchmen. This rule applies to any attack type, including punching or martial arts. The Defense Type vs. Attack Type table provides basic chance to hit depending on what you’re hitting and what you’re hitting with. Looking at this character, I’m reminded of one of the other things that used to bug me a little about V&V: many of the powers are rated according to a basic characteristic. In some cases, such as Mind Control range being governed by Intelligence, this makes some sense; in others, such as telekinesis and force field, it’s more than a little arbitrary. With Force Field, for example, I can “pummel” opponents with waves of force. The damage I do will be equal to my normal hand-to-hand damage. This makes me second-guess dropping strength yet again, because if I were physically stronger my force fields would do more damage. I vaguely recall a house rule in my college days that said, if any power uses a basic characteristic, and that characteristic isn’t reasonably tied to that power for everyone, then just roll 3d6 to get the power’s score. Thus Gorilla Grodd’s telekinesis would not be automatically massively stronger than Yoda’s or Brain Wave Jr.’s. As it stands, I’m seriously inclined to drop Darkness Control rather than Heightened Strength, because the latter will drastically improve my Force Field5. I’d probably add, today, that if a character has a heightened characteristic that would have impacted the power, then they can choose to replace heightened characteristic with heightened power. That aside, I’ve always had more fun with Villains and Vigilantes than with Champions or any other supers game I’ve read beyond my own, and nowadays I’d rank it above my own as well. I’m glad the authors have taken V&V back, and it’s awesome that services like Lulu.com make it easy for them to quickly get a product into the marketplace. Now, about my character. I’ve got a Jerry Stratton with the ability to become non-corporeal, control and create darkness, detect weaknesses, and project force fields. How about a name? Heading over to 50 Random Superhero Names, I get a list that contains The Mighty Wicked Tenth Saint. I think we’ll call him The Tenth Saint for short. But we’ll remember that he’s mighty wicked. The heightened strength comes from the force field: it’s an always-on, low-level force field that gives him the enhancements normally attributed to heightened strength: ability to take more damage, ability to cause more damage, and ability to lift, push, and bend heavy things. And the reason I can’t think of anything phobia-like is that phobias are difficult for player characters. Phobias don’t make sense, and player characters are rational. Phobias make more sense for non-player characters. The name of the weakness, however, is phobia/psychosis. A psychosis works pretty well for this character. I’m guessing from the random name that he received his powers in some heightened state; perhaps in a divine underground that can only be reached from the right frame of mind. He has communed with the greater powers of the Universe, and this is where he received his abilities. His psychosis is that sometimes he enters that state of mind when he should be doing something else. A psychosis involves hallucinations, delusional beliefs, or some other loss of contact with reality. That’s part of his non-corporealness. He’s literally detaching himself, partially, from reality. But he’s also running the risk of detaching himself fully from reality, and interacting with his teammates in an illogical manner. Hey, that’s me anyway, why not put it into my V&V me? It’s not so much that his psychosis makes him see things that aren’t there. But that he sees things that are there that nobody else sees because he’s looking at a “there” that they have no access to. And he misses things that everybody else sees, because in the altered states they are inconsequential. Normally he can keep track of the real vs. the surreal. But sometimes—perhaps under stress, perhaps just after waking, perhaps when alone—the cues that help him differentiate the real and the surreal are lost. Claustrophobia would make sense too, except that it’d be too easy to escape, normally. Yes, having that extra 15 on strength would be useful here: it would increase my likely Power score by over 40%! But I just like the idea of being incorporeal and using that to determine opponent weaknesses; if I didn’t discard strength I’d probably discard weakness detection. Subject to a potential arbitrary GM limit. It would also make Weakness detection more useful, but that makes sense: weakness detection lets me hit more often, and being stronger would make my hits do more damage. Generate fifty random superhero names and secret identities. The names link back to the character sheet if you’d like to see a hero’s abilities. As of today, you should be able to buy both the PDF and the print version of Villains & Vigilantes 3.0: Mighty Protectors. It’s a worthwhile purchase. Some are willing to kill everyone to eradicate drugs. Which wouldn’t work. If all stoners were gone, and it was just you, Lee Brown, and the DEA, wouldn’t you want to get high really bad? Villains and Vigilantes at Monkey House Games last modified October 13th, 2017.